This is the official last sunny and somewhat warm day in Portland, Oregon 2013. The cold and blustery weather has arrived and the creeks and rivers are beginning to become swollen with rain water and leavers. Even the mountains are preparing for a long and snowy winter. There is nothing more awesome that taking advantage of the very last day of perfect autumn weather and capturing it on film. You can attest by noticing how the trees are roasted in red, yellow and orange with just a dash of green holding out. The blue skis provides the perfect back drop with the low flying sun casting early afternoon shadows below. As I was walking along the east esplanade I noticed someone fishing down on the dock and decided to try and get a shot while he was casting. Since I didn’t have my tripod I was concerned that my shots wouldn’t be aligned so I ended up taking several shots as the fisherman continued to cast his fishing pole into the Willamette River. Luckily, most of the boaters had wandered off, so I wouldn’t have to worry about too much ripples in the water. Due to all of the wind and rain over the last few days, even if we are blessed with another sunny and cloudless day, you can bet that most of the leaves are off the trees. 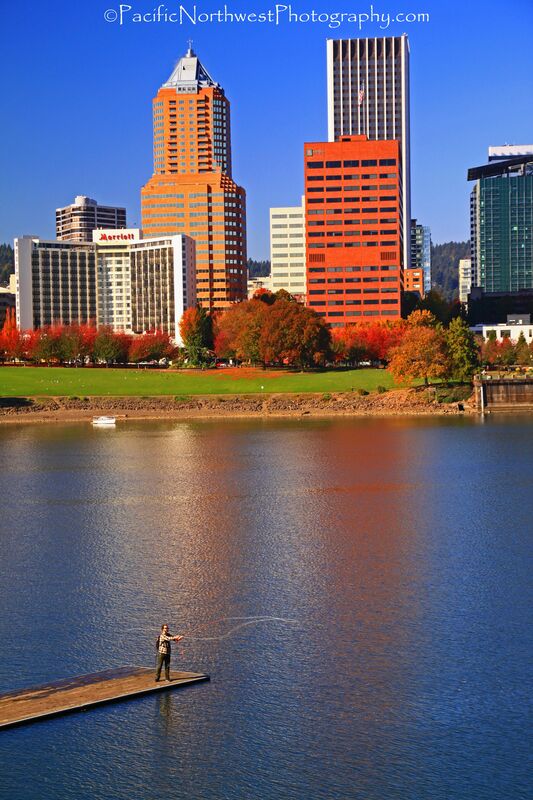 Therefore, I can almost guarantee that this is the last photo of a sunny autumn day in Portland, Oregon. [/caption] Another spectacular sunny but very cold January day in Portland, Oregon. 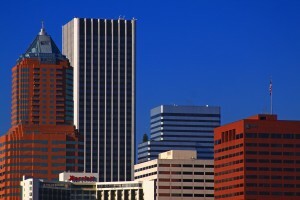 Again, not a cloud in sight and going on a record setting consecutive sunny streak in Portland, Oregon for the month of January. the views stretched well beyond Mt. Hood and into Mt. Adams, Mt. St. Helen’s and even Mt. Rainier. I was again drawn to the waterfront since the calm water and low sun had created another great reflection of the city in the Willamette River. I was able to take this shot without using a tripod and even took it while walking my dog along the east esplanade. I took most of my shots while only using one hand since my dog was diving for goose poop and anything else he could sniff out. However, I was able to use both hands part of the time by standing on his leash. I was using my Canon 28-135mm lens and set the focal length at 28mm in order to get the most panoramic shot without cutting off any of the reflection of the buildings. I attached my warming filter and CIR-PL, set the ISO at 100 and reduced the white balance to -0.3 due to the intense glare that was being created by the sun. Since this shot was taken while looking south the sun was particularly harsh and caused me to constantly adjust the white balance. The sun was actually in the upper left of the frame and at about a 90 degree angle. The color in somewhat washed out so I had to photo shop the color back into the shot. The camera was in Program/Normal mode so the aperture was at F-7 and the shutter speed was at 1/125 second. [/caption] Whoever said that it’s cloudy and rainy in Portland, Oregon during the month of January might want to avoid looking at this photo! This photo was taken yesterday on January 17, 2013 and as you can see it could almost pass for a beautiful July day if it weren’t for the dormant and bare trees in the foreground of the photo. The weather calls for more sunny and almost cloudless days and we’re looking at close to 15 days of sunny and cloudless days for the month of January. Therefore, we can all agree that Portland, Oregon has the most sunny days in the Country, right? Not quite! It can get pretty nasty for many days in Oregon but the best thing about the Pacific Northwest is that we get several days like this. Imagine that I could have instead driven 65 miles to the Mt. Hood wilderness and played in the record amount of snow and enjoyed a beautiful sunny day. Or I could have driven 75 miles to the Pacific Ocean and taken some epic sunset shots of a cloudless sky. Just making a point that the Pacific Northwest doesn’t just offer some of the most diverse landscapes on the planet but also offers some of the best weather as well. [/caption] A great place to get some great photos of the city is along the east side of the willamette river. And an even better time to visit is during Fall, when the foliage is starting to change colors and the skies are hinting at developing into a storm. I took this photo while standing between two of Portland’s most prominent bridges. The skies were a little bit gray but there was just enough blue sky and color to create a really nice scene. The river was calm so I was able to take advantage of a somewhat descent reflection of the buildings. The vegetation wasn’t quite peaking but the foliage was emitting a burning red glow from the tops of the trees. To get this shot I made sure to use my tripod, remote switch and bubble level in order to avoid any camera shake or blur. I was using my Sigma 17-70mm lens and set the focal length at 17mm in order to get the most panoramic shot as possible. I didn’t want to have any vignetting, so I wasn’t able to attach my ND4 but I was able to attach my CIR-PL and warming filter. I had the camera in Program/Normal mode and the shutter speed was at 1/100 second. The aperture was at F-5 and I set the ISO at 100 and the white balance at -1.7. 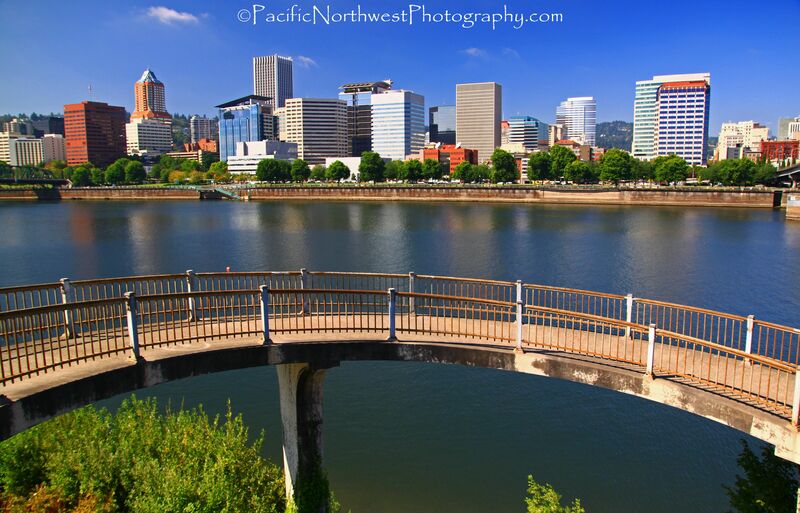 [/caption] Downtown Portland with the Willamette River and the Burnside Bridge in the foreground. This photo was taken from the east side of the river and I was standing just north of the bridge. I used some of the shade that the bridge was providing in order to avoid some of the glare due to the intensity of the sun. The sun was at about a 90 degree angle and just behind the steel girders. [/caption] Another perfect sunset along the Willamette River with downtown Portland and the Hawthorne Bridge. It’s pretty hard to get a shot of a somewhat smooth and calm river when there are dozens of outriggers and small boats motoring around the river. This is especially true if your trying to get your first opportunity to take advantage of a good glare of the city and its lights for the first time in 5 try’s. [/caption] Another sunny October day in Portland, Oregon! I never thought I would say this but can we please get a few months of rainy weather! Enough with the smoggy and hazy skies that make me feel like I’m in the Southwest. Can we please water the suffering vegetation that’s beginning to look like tumble weeds that are ripe for an inferno. And if the Willamette river gets any lower, you will be able to see all the trash that’s been sitting at the bottom of the river over the last 100 years. Seriously though, it’s great that we’ve have had 81 straight days of sunny and rainless weather but I’m ready for some true fall weather. I took this shot while standing directly under the east side of the Hawthorne bridge. I was able to walk out pretty far onto some old concrete pilings that I had never seen before due to the shallowness of the river. I set up my tripod and tried to get a good angle of the bridge and the city in the background. The personality of the sky and river are somewhat bleak due to the hazy smog but at least you can see that the weather was nice. I was really hoping to get a good glare of the buildings reflecting off the river but as you can see I was disappointed. I wanted to get a good panoramic view so I set the focal length at 17mm and set the ISO at 100 in order to remove some of the over exposure caused by the poor air quality. I also attached my UV, warming and CIR-PL filters so I could avoid too much noise from the sun and glare from the river.